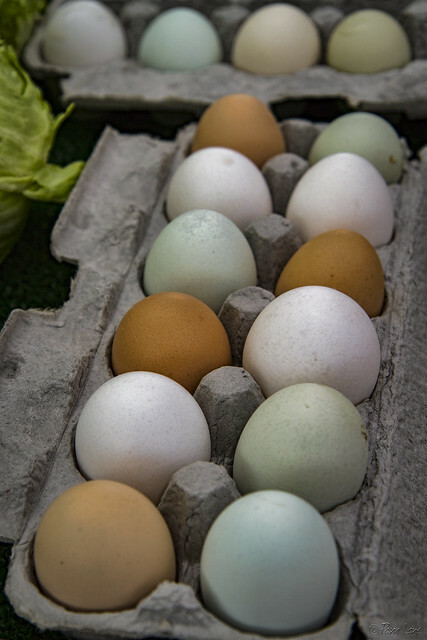 Eggs are one of the many fresh foods that you'll find at the Saturday farmers market in downtown Downey. But have you ever wondered why there are so many egg colors? Some people have thought the the color of the feathers correlates to the color of the eggs. But a far better indicator is the color of the chicken's earlobes? (You didn't think chickens have earlobes? Guess again.) Chickens with white earlobes lay white eggs. Chickens with red earlobes lay brown eggs. And apparently no one has checked the earlobes of the chickens that lay those green and blue eggs. But the actual determining factor is the genetics of the hen. For example, Leghorn chickens lay white eggs while Orpington's lay brown eggs and Ameraucana produce blue eggs. And no matter the color, they all taste basically the same.